Why Buy A Fondue Pot? “Hygge” (a Danish word, which translates as “living well while living simply”) is very much on-trend at the moment, and the Swiss staple of fondue, while not exactly Scandinavian, epitomizes the concept of Hygge perfectly. What, after all, could be better on a cold winter's evening than a table packed with friends and family, all dipping into a variety of different types of fondue – cheese, chocolate, or even meat. So – buy a fondue pot, and be cozy and stylish this winter. In fact, why not buy several, and wow your guests by presenting every variant of fondue on the same table, at the same time?! Whether you're dipping strawberries into chocolate, cocktail sausages into cheese, or lumps of Gruyere into a simmering, succulent meat fondue, this is guaranteed to be a go-to accessory over the festive period, and far beyond. No matter if its a large festive gathering you're catering for, or just the two of you over a cozy Christmas, there's a fondue pot to suit you and your table needs, just waiting to be discovered and explored. The Cuisinart CFO-3SS offers contemporary convenience with an easy to use electric fondue pot that provides variable temperature controls, and eliminates the need to pre-melt chocolate (when making chocolate fondue). 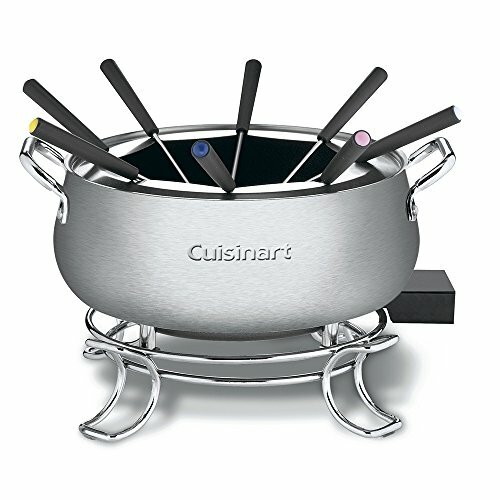 The Cuisinart offers stylish, easy to clean design, and comes with all the essential basic accessories,such as fondue forks, etc, so you can get on and start making – and enjoying! - delicious fondue straight out of the box. This model is stainless steel, and dishwasher safe, meaning your fun fondue evening won't be dampened by endless cleaning afterwards. In ever-stylish black, with a ceramic pot, and including ceramic fondue forks, the Swissmar Gruyere can be used on the stove top, for a traditional experience, or in the microwave, if time is of the essence, and is also dishwasher safe. This is a traditional, melt-it-over-a-heat-source fondue pot, so would probably benefit from being placed on a suitable table-top pot warmer once the fondue is made, to keep everything warm and tasty. It may also be less suitable than an electric model for meat fondues. However, it is dishwasher safe, so doesn't involve a lot of traditional, labor-intensive cleaning! Its simple, classic look will sit well on any table, and ensure you are completely echoing the Hygge concept of stylish comfort! Also from Swissmar, the Lugano comes in an attractive and contemporary cherry red, and is a cast-iron construction, ensuring even heating whatever kind of fondue you're making. 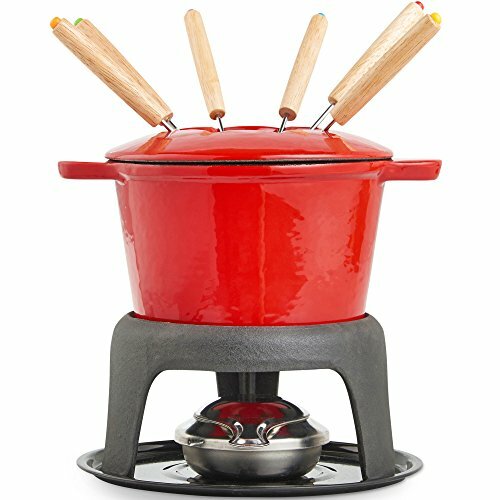 This fondue pot is suitable for stove-top use, and so is ideal for a traditional, authentic experience. It includes all basic accessories, meaning you're ready to go. Being cast-iron, the Lugano is difficult to clean, particularly after cheese fondue, and it has been noted that the pot has a tendency to slide around a little in its holder, which can be disconcerting to a novice user. 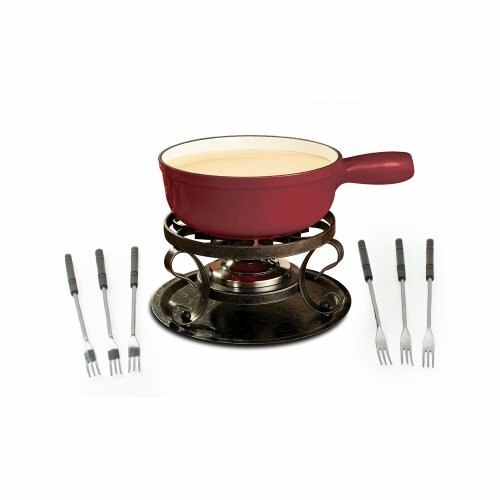 The VonShef Fondue Set, while best suited to the more familiar cheese or chocolate fondues, is nevertheless an attractive, functional fondue pot, offering stylish cast-iron design in a bright, eye-catching color (cherry red), coupled with the practicality of an adjustable flame-burner, and space-saving, portable design, ideal for stylish apartment living. It comes complete with fondue forks, so you can get started with cheese or chocolate fondue fun straight away. 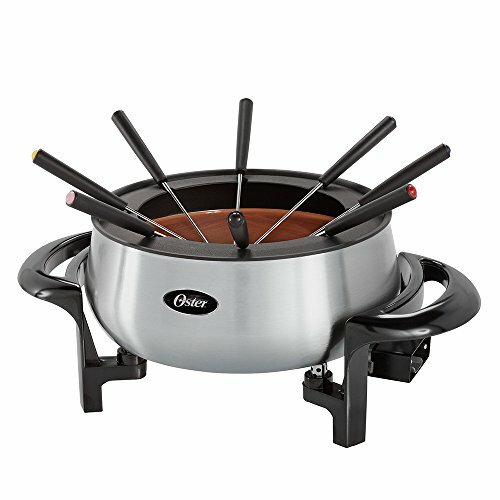 Finally, we have the Oster FPSTFN 7700-02 three-quart fondue pot which, as with all the fondue pots here, includes fondue forks. The Oster is ideal for those just starting out with fondue, or for those who don't anticipate a lot of use, but would like to have fondue at a festive family gathering, for example. While seemingly large, the actual pot is broad, rather than deep, meaning you don't get a lot of fondue per batch, and it does struggle more than most fondue pots with holding and regulating temperature, resulting in either cool fondue, which you don't want, or cheese fondue burning on the bottom of the pot. 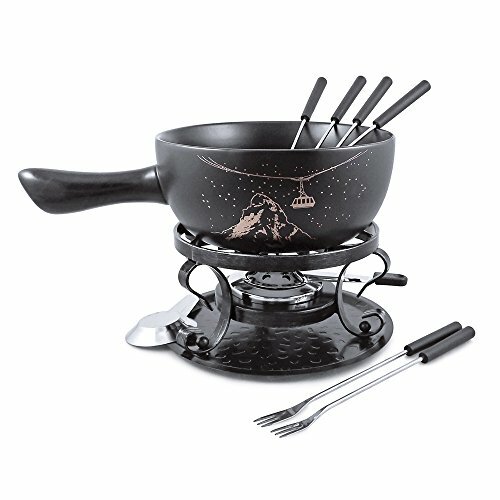 However, for a couple who wanted to try fondue for a bit of fun, the Oster would be more than suitable. While the most popular, and best known, fondues are, of course, the cheese and chocolate varieties, you can also make meat fondue – meaning that you can offer a touch of class at dinner parties, and, indeed, provide three courses of fondue, if you were so inclined – a cheese fondue starter, a meat fondue main course, and, naturally, chocolate fondue for a sweet dessert, all with appropriate dipping accompaniments, of course! With all fondue, whether meat, cheese, or chocolate, the fun comes from finding suitable dips – fruit is popular with both cheese and chocolate, and, of course, marshmallow dipped into chocolate fondue is always a firm favorite, but why not be more adventurous, and dip lumps of hard cheese into meat fondue, or small pieces of meat into cheese fondue? You could even have two fondue pots on the go – one cheese, one meat – skewer a selection of vegetables on a fondue fork, and have an all-in-one dinner, complete with cheese sauce! Fondue is the ultimate sharing food, and thus an ideal centerpiece to bring guests together around a celebratory table – why not line up the fondues, and invite your guests to bring their own dips?